What is a Domain Name Hack? A domain hack? That sounds like something a malware programmer would write to steal somebody’s website. Actually, a domain name hack is neither malicious nor illegal. Domain name hacks (also referred to as domain hacks) are domain names that use the top-level domain (TLD) to complete the word or phrase of the domain name URL. Del.icio.us, the social bookmarking service, is a classic example of a domain name hack. In this context, the hack represents a trick (as in programming), not an exploit or break-in (as in security). Hand registering a domain name hack is less expensive (usually around $10) than buying an already registered domain name – whether in use or not – from another person or domain investor (usually around $200 to $2,000). While Blogs.com was first registered on September 10, 1999, and could cost millions to purchase in 2000, blo.gs was available until 2001 and might have been initially registered for around $40. This cost savings can be essential for a new company with little funding. If the website takes off, however, it can cost more in the long term. For example, when del.icio.us tried to buy delicious.com, they discovered that their brand recognition had increased the price considerably and regretted building their brand on a domain name hack. Bit.ly, the most popular domain name shortener in the world, launched using the country code (cc) TLD for Lybia, and encountered the same issue of brand recognition when buying bitly.com. The .com versions of well-known domain name hacks are highly desirable to domain investors who then sell them to the highest bidder. Domain name hacks are useful if your desired domain name is already taken. They can be a very good way to create a short, memorable URL. If your company has a very long name, domain name hacks can make your URL shorter as is the case with Amazon.com using a link shortener domain name hack like amzn.to/mS8aMc or this site, DomainSherpa.com, using a link shortener domain name hack to this article on domain name hacks: https://www.domainsherpa.com/hack. Domain name hacks can also mark you and your company as forward thinking and innovative, and make it easier to casually insert your domain name into your advertising. A great example comes from Eric Ries, founder of The Lean Startup, who uses ericri.es. Ries uses this domain name – a ccTLD for Spain – as a custom URL shortener through the Bit.ly service. When Ries shares links on any social media platform, such as Twitter, Facebook and Linkedin, he increases his own brand in the process. On the other hand, domain name hacks can be confusing to potential customers. For example, both awesome.com and awe.sm as well as bump.com and bu.mp exist but are owned by different companies. How much traffic bu.mp loses to people who drop the dot and add the .com to the end is hard to measure, but it is probably quite significant. Many Internet users, especially Americans, expect a URL to end in .com or .net, and dots in the middle of words are counterintuitive to most people. When using a domain name hack, it pays to verbally emphasize the hack in at least some of your mentions of it (e.g., bit dot ly, flicker dot com but without the e), making it easier for people to remember it and put it in the right place. Yahoo learned this the heard way, buying the photo sharing service flickr.com in 2005, and almost five years later paying another six figures for the correct spelling of the name, flicker.com, which was reportedly receiving 3.6 million unique visitors a year. Having an indirect association with a specific country may have a negative effect. Some customers may be put off by, for example, an obviously non-U.S. domain name being used by a U.S. company, or a U.S. domain name (.us) being used by a non-U.S. company. Not all governments around the world are stable. Bit.ly uses the ccTLD for Libya. Although the domain name is short and memorable, there is one major problem: Libya is not a stable government. If Muammar Muhammad al-Gaddafi, the Libyan leader, had actually brought down the Internet in Libya during the 2011 protests, bit.ly – and hundreds of millions of shortened URLs around the world – would have gone dark and not resolved. You can avoid this by sticking to extremely stable country ccTLDs such as .us (United States) and .im (Isle of Man). Not all governments believe in free speech. This concern came up for another company using the .ly extension. Vb.ly had their site taken down by the Libyan government because its content violated Islamic law. By registering with a foreign country’s extension, you risk running afoul of their laws or regulations. 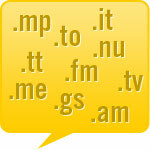 Further, some countries restrict foreigners from owning domain names with their extension. Breaking those rules can send your site dark for good, costing you money and customers, not to mention impacting your company’s reputation. If you are interested in purchasing domain name hacks that have been registered, you can find the largest selection on the web at CAX Domain Name Hacks. Otherwise, find a domain name registrar that sells the ccTLD of interest to you and reserve a domain name for the cost of the registration. In short, domain name hacks are an extremely useful way to promote your company, and can, if used correctly, save money and drive traffic to your site. They are not without their pitfalls, however, and you should think very carefully before using a domain hack instead of the traditional .com. Love your site btw, great interviews! Domain hacks are fun, and they sure can help make a cool brand. I agree its essential to take other steps if you are using a domain hack for a business, to try and funnel as many of your customers as possible to the right place. Buying the similar .com when you are able to is probably a good idea. I was disappointed to find such gems as sno.gs sla.gs bon.gs & dru.gs all gone, d’oh. I think with domain hacks 99% they are collectors items only really, I doubt most will ever sell for even reg fee. Great article, Michael. Domain hacks can be fun and quirky, but you can’t beat a good .COM. I’ve found it particularly interesting to see the emergence of domain name hacks being used as URL shorteners, thanks to Twiitter. Seems like most web 2.0 sites have a short version these days. I don’t know why exactly, but I bought http://provi.so when Somalia opened up its TLD recently. Very rarely, you can form a domain hack using the dot. Great article! I just got my first domain hack and I think it’s a beauty! Perfect for our Ringtone App business. I will take your advice and spell out RINGTON dot ES in literature! It’s likely that there are root name servers for most TLDs outside of their home countries. According to a CNN report, only 2 of the 5 .ly root servers are actually in Lybia (http://money.cnn.com/2011/02/21/technology/bitly_libya_service/index.htm). That’s great to know, Ricardo. Thanks for sharing. I wonder if the remaining 3 RNS are controlled by Libya in some sort or fashion, or if the remaining 60% of bit.ly users would still be up and running should the entire Libyan Internet be turned off. Let’s hope that it never comes to this to find out. I use this rule for startups I mentor: never use a domain hack if you’re building a business. If it’s going to be your personal service, for friends and family only, then go for it — use a domain hack, spend less money, and be cool. But if you’re building a business, you know what’s cool? Having your customers actually find your business when they type your company name into a search engine and add a “.com”.